The Roadshagger Racing Audi RS 3 LMS set the pace in the ‘Roar before the Rolex 24’, a three-day test at Daytona International Speedway in view of the opening round of the IMSA Michelin Pilot Challenge, a 4-hour race on 25 January. Nine TCR teams took part in the event that included six hours of testing. The first three sessions were topped by the Honda Civic run by the LA Honda World Racing, with Mike La Marra posting fastest laps of 2:00.678 and 2:00.980 in the first two sessions, before his co-driver Tom O’Gorman went faster in session 3 with 2:00.475. Roadshagger Racing’s Jon Morley posted a new provisional fastest lap of 2:00.254 in session 4, but during the fifth session Lee Carpentier improved, as he was clocked at 2:00.253 in his eEuroparts.com ROWE Racing’s Audi. Morley improved further and smashed the 2-minute wall in the final session, posting a 1:59.900 that represented an improvement of 65 tenths compared to last year’s pole: 2:00.550 set by Rodrigo Sales’ Compass Racing Audi. 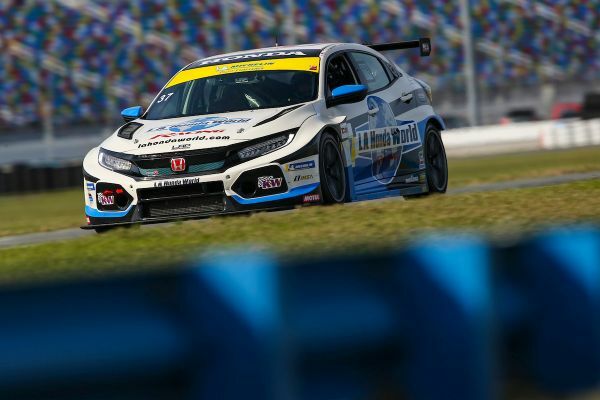 2018 Pirelli World Challenge TCR champion Ryan Eversley ranked fifth in the HART Honda Civic (2:00.528), behind Morley, Carpentier, O’Gorman and Todd Lamb’s Atlanta Speedwerks Civic (2:00,494). The Alfa Romeo Giulietta entered by KMW Motorsport with TMR Engineering struggled to stay on the pace in the beginning, but in session 5 Roy Block (2:01.253) and Tim Lewis (2:01.293) were able to reduce the gap from the fastest car to 1.3 seconds. Roar Before The Rolex 24 Is This Weekend!